The camera features Panasonic’s innovative Depth from Defocus (DFD) AF and hybrid 5-axis stabilization (during video capture). It can shoot bursts at a rate of 7 fps (with AF and live view), however, the FZ2000’s video options are arguably more attractive, offering 4K video, both DCI and UHD at 30p and 24p with high bit rates, and a wide range of recording formats. The camera also includes useful video-centric capture tools such as peaking, color bars, and zebra patterns, as well as 10-bit 4:2:2 output over HDMI, as well as mic and headphone jacks. The FZ2000 is available now at around $1199. 12 fps continuous shooting (7 fps in continuous AF). 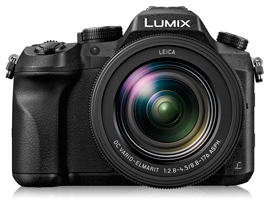 Overall, the Panasonic Lumix DMC-FZ2000 has very good image quality, and delivers metric scores that are among the best in class for the 1”-type sensor. The sensor has excellent dynamic range at base ISO, measuring a usefully wide 12.6 EV at ISO 100 (per manufacturer) and maintains a still-excellent 10.3 EV at the manufacturer’s ISO 800 setting, making it not only well-suited to scenes with a wide range of tones, but also for general photography when backlighting may be an issue. The Panasonic Lumix DMC-FZ2000 also achieves an excellent 22.9 bits for color depth at base and continues to offer excellent color discrimination at higher ISOs, at least to ISO 400, where it just comes in at our 20-bits quality threshold. The 1” sensor also does relatively well in the low-light ISO score, just meeting our 38dB threshold in the signal-to-noise ratio (SNR 18%) tests at base, with good-quality low-noise images still achievable at up to ISO 400, and arguably up to ISO 800 (at which the sensor nudges the 30 dB limit). Indeed, the scores for the FZ2000 closely resemble the image quality scores achieved by the recently reviewed DMC-LX10, so we can quite safely say it uses the same sensor. Comparing the sensor’s performance to its predecessor, the FZ1000, and to its main rival, the Sony Cyber-shot DSC-RX10 III, we can see that the new Panasonic is using a updated sensor with practically identical image quality to its rival, suggesting they’re now using similar technology. Be that as it may, while the differences in the results look encouraging for the newer models, the improvement in sensor dynamics is really only incremental. If you have an FZ1000, it is still a great performer. Noise levels at anything other than base ISO are still somewhat challenging for a one-inch sensor, even if they’re an improvement over the smaller sensors used in compacts. At base, all three sit around the 38 dB minimum threshold for excellent image quality and provide good results up to ISO 400. Indeed, all three share similar noise characteristics up to ISO 3200, at which only the Sony differs slightly by using smoothing to lower noise, gaining around a hardly noticeable 2 dB in the process. Predictably, the FZ2000 and Sony have all but the same dynamic range at every ISO setting (and their measured ISOs are similar, too, for what it’s worth), and both comfortably out-do the older sensor in the FZ1000 at base by around a stop (+0.9 EV). However, at higher ISOs to ISO 800 (per manufacturer), the differences are too small to worry about, even though the Sony shows a modest improvement of around +0.33EV from ISO 6400 (per manufacturer). Again, it’s no surprise to see all three share similar results for color sensitivity, with the Panasonic Lumix DMC-ZF2000 and Sony Cyber-shot DSC-RX10 III showing marginally improved color discrimination at base, but only negligible advances at the higher ISOs where it would be really useful. The results support the belief that the two new models share similar sensors, but it also demonstrates that the improvements (while welcome all the same) aren’t perhaps quite the leap forward that the manufacturers would like us to believe. Given the results of the recently-reviewed Panasonic Lumix DMC-LX10, it is hardly surprising to see the Panasonic Lumix DMC-FZ2000 delivering practically identical scores and therefore similar image quality. With excellent performance in all categories for this sensor, and with its 20x optical zoom and attractive video capability, the Panasonic Lumix DMC-FZ2000 looks like a tempting choice for this type of camera.